Global MapleStory Best in Slot/Progression Guide | Dexless, Maplestory Guides and More! Hello, this is LittleLamb bringing you a GMS BiS Table and Progression Guide for Normal Server. The basis of this guide is to see how boned you are in the grand scheme of things if you decide to be a whale, and how hopeless it is to get these BiS gears if you decide not to. The guide will be divided up into sections explained in the main guide. Thank you! There might be a few errors lying around but for the most part, it is basically complete. looks good, but is there any potential for lucky items to be bis? Not really. At the very end of the day, Arcane Umbra Shoulder > Scarlet Shoulder, Transposed Sweetwater Hat is most certainly > Lucky Hat. Absolab Shoulder is still probably better than Scarlet Shoulder if you have an assload of stat, but it's not really out of the question. Id like to point out that the 7 Day Monster Parker is stronger than the cvel or cvonbon medal. And do you ever plan on adding a section for Reboot? No I do not. It may or may not be more powerful than the Chaos Vellum Medal, but I'll put it up there anyway. Here is some quick math I did on it. Unless someone has endgame IED and no basically no dmg and boss (less than 350 combined) then it is better than the cvel medal as well. Again, I've noted that the CVell and CVB medals were extremely edge case in cases where the ATT and Stat would give less damage than the IED or Boss. That said, YMMV; you cannot say that because you have the highest IED from non-class sources that 10% IED will always be better than the 5% Boss from the CVell medal. Your data isn't practical. That's all I'm saying. Except the IED is always better because the medal also has stat and att. The only time this really starts to break down is when someone has over 99% IED without the medal (which they shouldn't as most optimal endgame potential set ups require only 1 line of IED), in which case the Beater medal or ReZero medal would be next best. I don't think you understand how quickly Stat and ATT deteriorate as you get more and more of it. For the sake of reference, Arcane Umbra hat beats Transposed Sweetwater Hat merely because the 10% IED on the Hat trumps the 400~ all stats at the very end of the day... which is what these choice of medals are in response to. When you have enough stats and att, the Damage increase is so negligible that you're basically ignoring stats on items now. I am aware of how att and stats do diminish, however you cant just ignore something because the gains are small. Here is the medal at 99% IED, something no one should have naturally without event buffs and party buffs, Ive taken the total dmg gain at 2000 att and 4000 stat (not sure how much base stat you can get on reg servers) but on Reboot you can get about 1400 att and ~3400 base stat. The cvel medal just starts becoming better past 98.5% IED. I don't think you understand how small of a gain it actually gets in normal server. Also, visual IED is deceiving because it does not account IED from skills and certain passives, making this IED less valuable. That's not to say the IED from the Arcane Umbra Hat example is much worse; the actual amount of stat you would need to try to break that IED is impossibly large, mind you. I wasn't talking about the visual IED though, and as far as Im aware normal servers and Reboot have nearly the same IED, the only exception being Zero Link. Do you know how much IED some classes get? For example, Marksman's Rangefinder gives them anywhere from 50-71% IED. You also have Vital Hunter which gives them 50% more IED... My point is, that medal is not absolutely BiS at the end of the day, and is just merely one of the contenders; the other being Chaos Vellum Medal. Yes Im aware of how much IED some classes can get, and even for Marksmen the MP medal is better than the cvel medal for both regular and Reboot servers. Regular server Marksmen should have a total of ~450% boss + dmg and Reboot Marksmen should have ~500% boss+dmg. 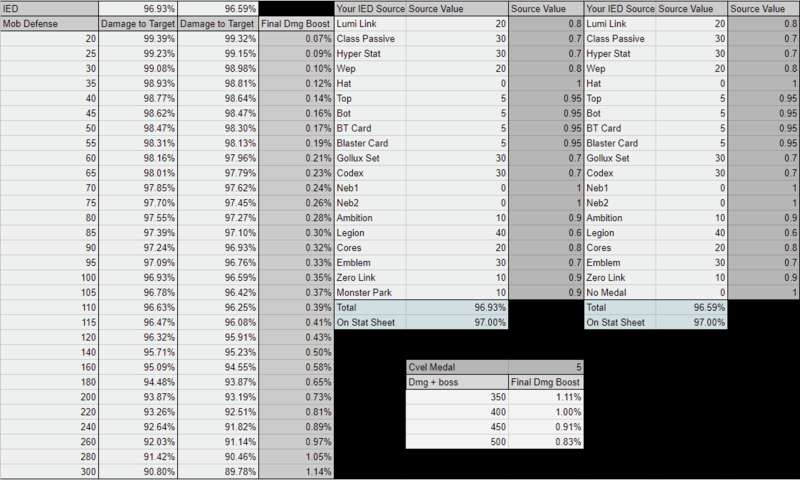 IED values taken from here. I think arcane hat isn't BIS in regular servers due to how much IED% you can get from other sources. You'd be surprised how little damage you gain from stat and att very late game. Enough so that the IED on the Hat is better than the stat increases.